The ecommerce checkout experience often carries high levels of complexity while also being full of business rules and customisations. Specifically, the payment and order management systems of web checkouts are incredibly complicated processes, are the most susceptible to latency, and incredibly vulnerable to bugs. Bugs which are due to the large amount of coding and third-party integrations involved with the online purchase of a shirt or two. There are, however, ways to make web checkout easier, including better communication channels between web and app, and the implementation of Apple Pay. 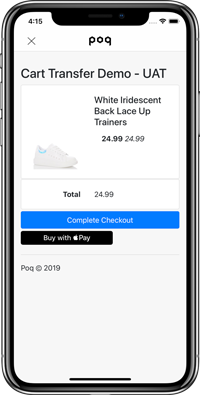 This blog is about how Poq has improved the web-based checkout experience for its clients with a highly innovative communications bridge and new Apple Pay capabilities. The result is a faster launch time for new apps, and the payment simplicity that shoppers are looking for. In order to quickly deliver our clients’ apps to market and avoid as much complexity as possible, Poq typically launches apps with a high performing web-based checkout. Building and launching a native checkout generally comes at a later phase of app development, calling for in-depth requirements and discussions to ensure our clients provide the best customer experience. However, to ensure our clients provide their customers with the best web checkout experience during the earlier stages of app development, we are constantly listening to their feedback and tracking their experiences. As a result, we have built a bridge that uses an event listener between web and app, a new and more powerful way of communication between app and web. While we have always been able to communicate from app to web, we have developed an innovative solution to establish a communication bridge from web to app. This new functionality improves the overall robustness of our web-based checkout and allows for more customisations and integrations. As previously mentioned, this new communications bridge not only improves communications but also allows for more customisations to web checkout, including the implementation of Apple Pay. Previously, web technologies and web checkouts could not display Apple Pay due to Apple’s automatic disabling properties when trying to launch Apple Pay on a webview within an app. Despite out-of-box Apple Pay capabilities within SFSafariViewController, the view controller does not allow for any customisations or analytics trackings, two functionalities we would not compromise on. As a result, despite some of these inherent limitations, we worked together with Apple to build Apple Pay implementation capabilities into our web checkout while maintaining and improving customisation and analytics capabilities. A solution only three other companies have achieved. According to Internet Retailer, ecommerce sites supporting Apple Pay have experienced an increase of up to 200% in their checkout conversion rate on mobile while checkout times have also decreased by 60%. When adding Apple Pay into a web-based checkout, customers experience the simplicity of a native checkout on web. By providing this type of experience on web-based checkout, Poq clients reap the benefits of a native payment solution. In September 2019 the European Economic Area (EEA) will implement Strong Customer Authentication (SCA) for purchases greater than €30. It is a two-step authentication process that will combat fraud by increasing security when verifying payments. This new process could drastically affect conversion rates and increase the pains of checkout. However, due to its inherent safety through the use of biometrics and passwords, customers can completely avoid SCA by utilising Apple Pay. We will be discussing SCA in a future post, but to learn more about the new rules and its implications now, be sure to read Stripe’s SCA Guide. With the new communications bridge, Poq clients will not only have a vast number of checkout complexities and pain points removed, but their developers will also have the freedom to build more customisations and integrations. And with Apple Pay, their conversion rates are sure to improve. Stay tuned to learn when the Poq’s latest web checkout features will be launched. In the meantime, check out some of our other product features and improvements on our Product Chronicles page. *It is important to note that this new event listener will only be available on iOS.